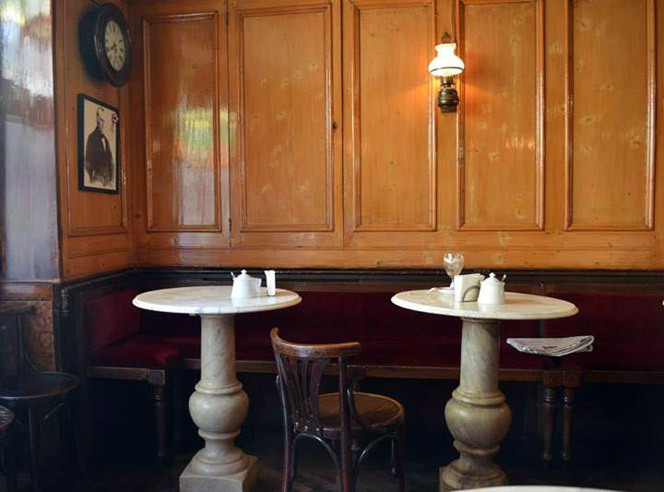 Although it opened in France, the first literary café in Europe was the endeavor of an Italian man: young Francesco Procopio dei Coltelli, from Sicily, opened Le Café Procope in Paris in 1686. The Procope was located opposite the Comédie Française theater, which had been built only a few years earlier, and soon became one of the centers of the Ville Lumière’s political life, as well as a favorite meeting point for intellectuals of the Enlightenment and leading figures of the French Revolution, from Marat to Danton, from Robespierre to Diderot, from D’Alembert to Mirabeau. Italy’s own tradition of literary cafés – where the cultural and social destiny of the Old Continent was written – began in the 18th century. That is when cafés provided a jolt of caffeine to the revolutions of the century, and became intellectuals’ and patriots’ tribunes, schools, theaters, libraries, political headquarters, and literary salons. Throughout the country, some very sedentary patrons planned the nation’s unified future, ironing out the details of the Italian Risorgimento. To say it with Montesquieu, literary cafés were the place where the conversation creates reality, where giant plans, utopian dreams, and anarchist plots are born without having to leave your chair. 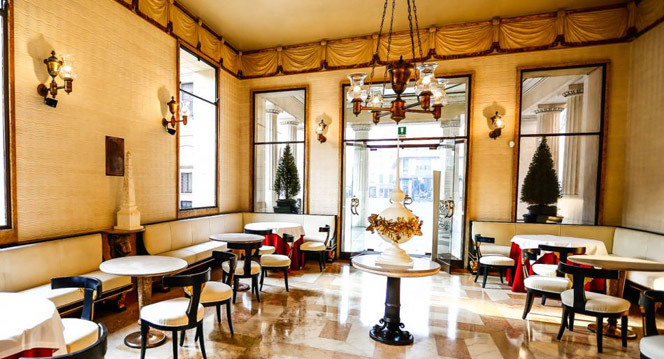 Let us take you on a tour of nine beautiful Italian cafés, still in business today. 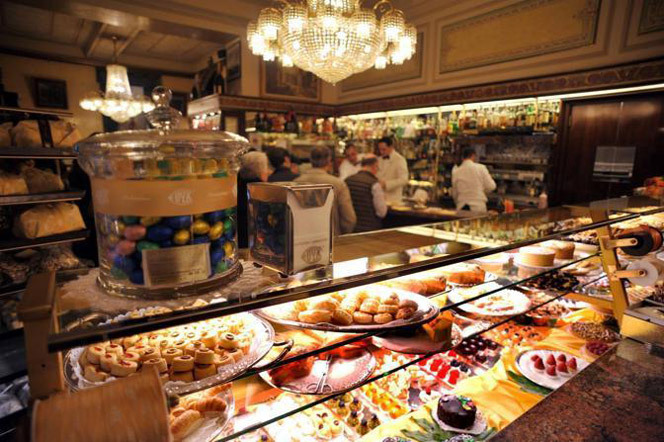 We start from the northeast, where Caffè Tommaseo is one of the oldest cafés in Trieste, the capital of Friuli. It is named after Niccolò Tommaseo, the hero of the short-lived and heroic Republic of San Marco (1848-1849) and author of the “Dictionary of the Italian Language,” the most important vocabulary published in the country during the Risorgimento. The date of its foundation is uncertain, but we know that by 1830 its lounges were full of stock market bankers, journalists, artists, lawyers, and writers. 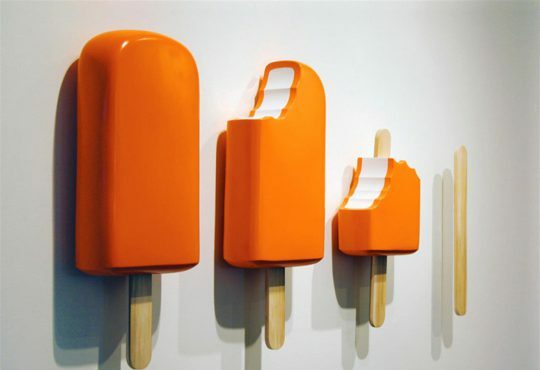 It continued to attract the literary crowd for centuries, with regular guests such as James Joyce, Italo Svevo, Franz Kafka and, in more recent times, Fulvio Tomizza and Claudio Magris. 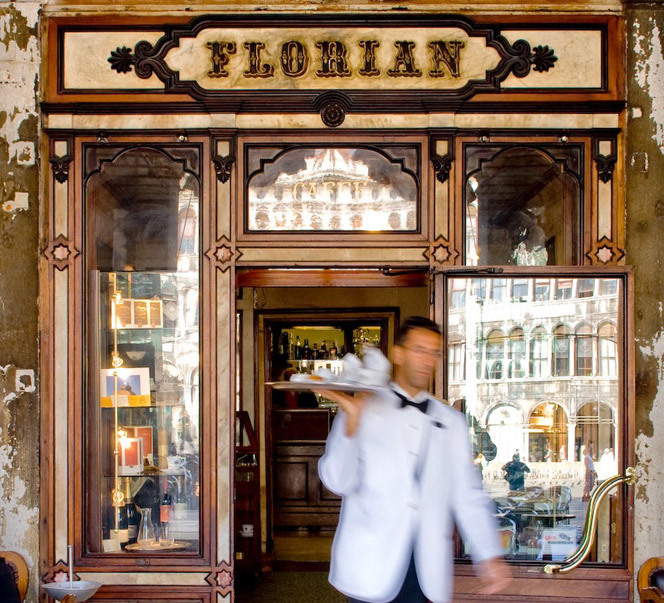 We move from Trieste to Venice, where the famous Caffè Florian opened in the iconic Piazza San Marco in 1720. Founder Floreano Francesconi had originally thought of a fancy name for his café: Alla Venezia Trionfante (“At the Triumphant Venice”). 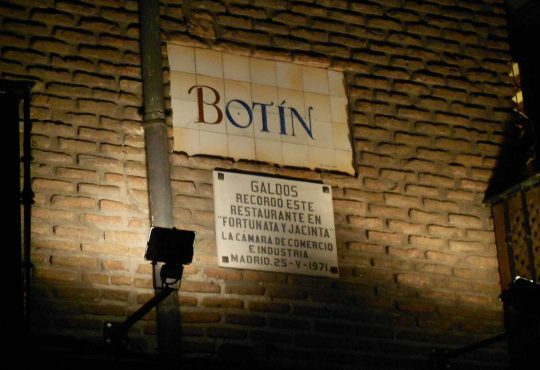 But locals did not take to that pretentious designation, and began to call it simply with its owner’s name, adding, of course, the local pronunciation: “Floriàn”. 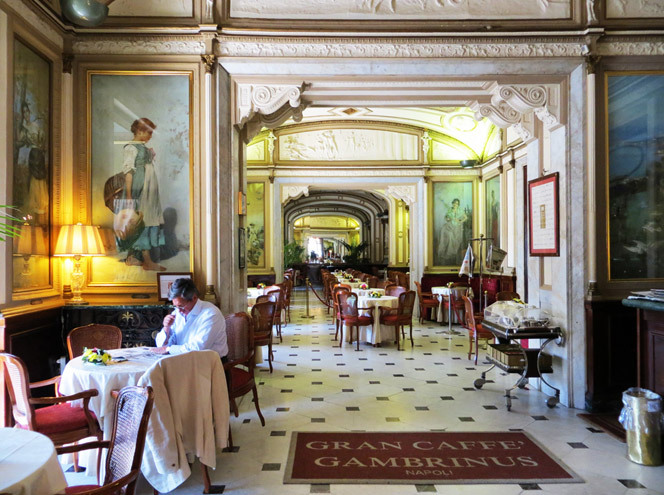 So many famous people have sat in these frescoed rooms, at these white marble tables, that it’s hard to mention only Stendhal, Ugo Foscolo, Lord Byron, Honoré de Balzac, Richard Wagner, and Charles Dickens. 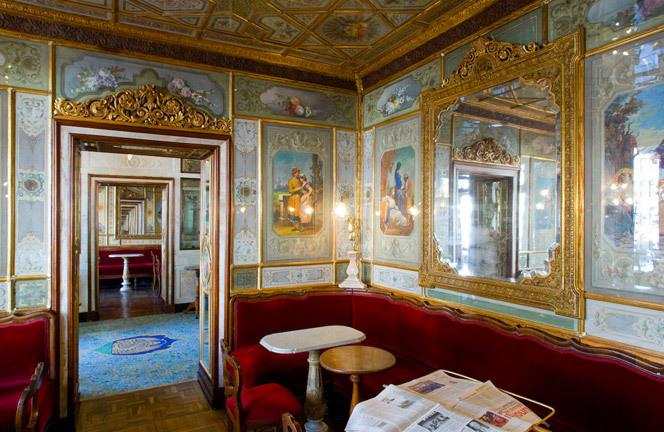 Before leaving Veneto, let’s go to Padua to visit the beautiful Caffè Pedrocchi, built between 1831 and 1842. 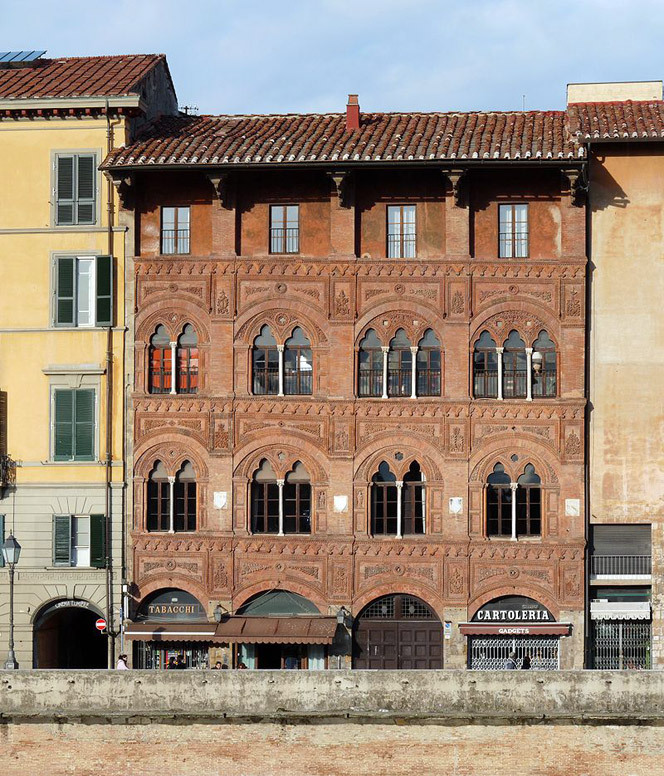 Known as the “door-less café” because it was open around the clock until 1916, it was designed by Giuseppe Jappelli for Bergamo-born Antonio Pedrocchi, and was one of the most important meeting places for the patriots who started the Risorgimento uprisings. For years, this neoclassical building was where literary and satirical journal editors, college students, directors and professors of the University of Padua and politicians met to talk and discuss everything and anything. 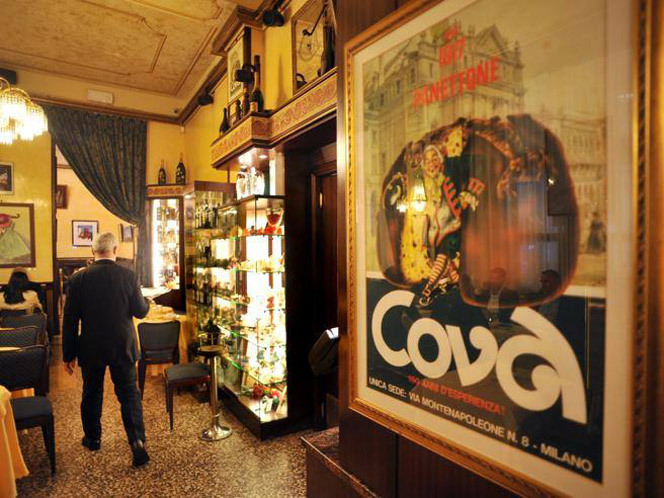 On Via Montenapoleone in Milan, near the La Scala theater, the elegant Caffè Cova – now known as Pasticceria Cova – opened in 1817. It was the place to be for the city’s upper bourgeoisie, as well as for important writers like Arrigo Boito, Giovanni Verga, Federico De Roberto, Giuseppe Giacosa. Even Giuseppe Verdi often sat at its tables. The famous venue is also proud to appear in some of American writer Ernest Hemingway’s works, such as “The First Forty-Nine Stories”: We ourselves all understood the Cova, where it was rich and warm and not too brightly lighted, and noisy and smoky at certain hours, and there were always girls at the tables and the illustrated papers on a rack on the wall. The girls at the Cova were very patriotic, and I found that the most patriotic people in Italy were the café girls – and I believe they are still patriotic. 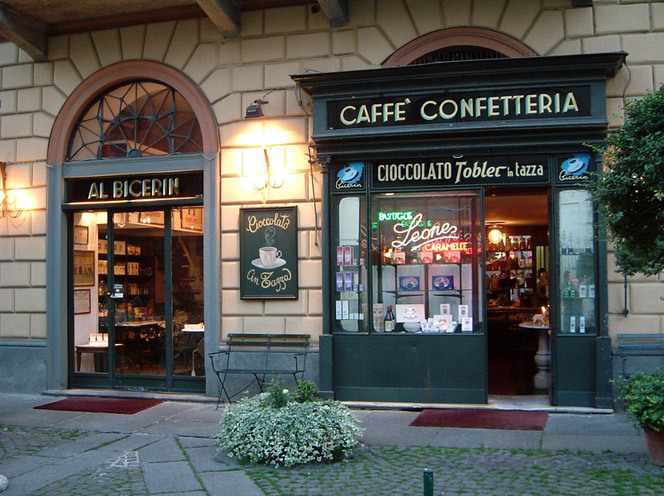 From Lombardy to Piedmont, and from Milan to Turin, where Caffè Al Bicerin was established in 1763. 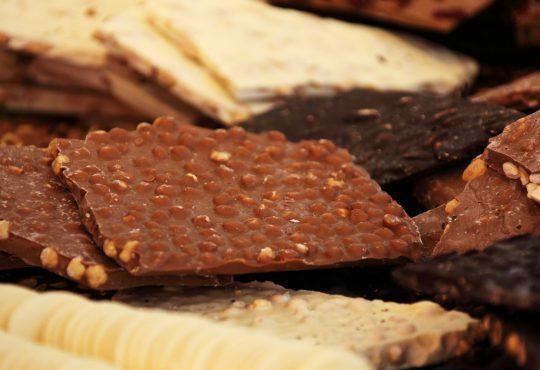 Named after one of the city’s iconic drinks – the “bicerin” (meaning “small glass” in Piedmontese) is a sweet mix of milk cream, chocolate, and coffee – this historical café is at the heart of the city, near the Sanctuary of the Consolata. 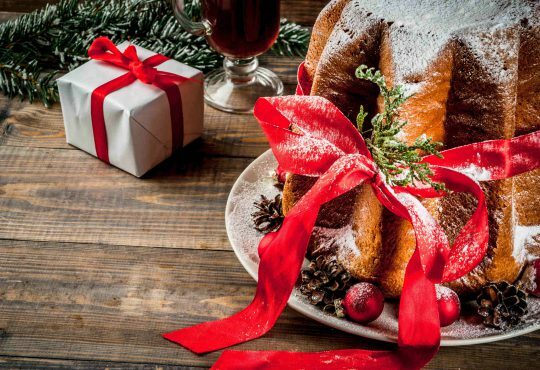 Indeed it owed its initial success to the fact that the faithful went there right after mass, to finally feast after fasting for many hours (until 1957, the “Eucharistic fast” required no eating or drinking from midnight to mass). 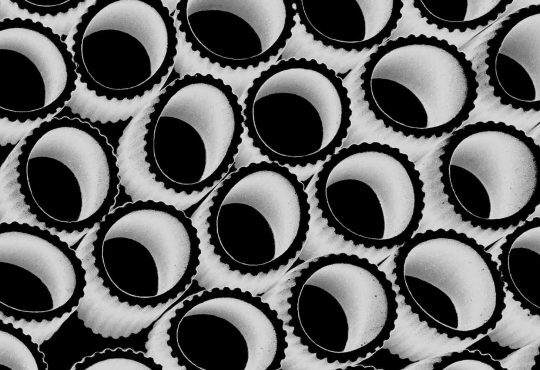 Some of those anonymous Sunday patrons sipped their “bicerin” at the side of famous men such as Count Camillo Benso di Cavour, Alexandre Dumas father, Giacomo Puccini, and Friedrich Nietzsche. 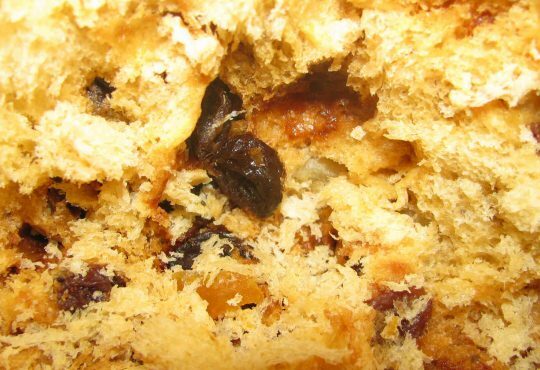 Travel down towards central Italy and head to Pisa, in Tuscany, to visit the Caffè dell’Ussero, founded in 1775. 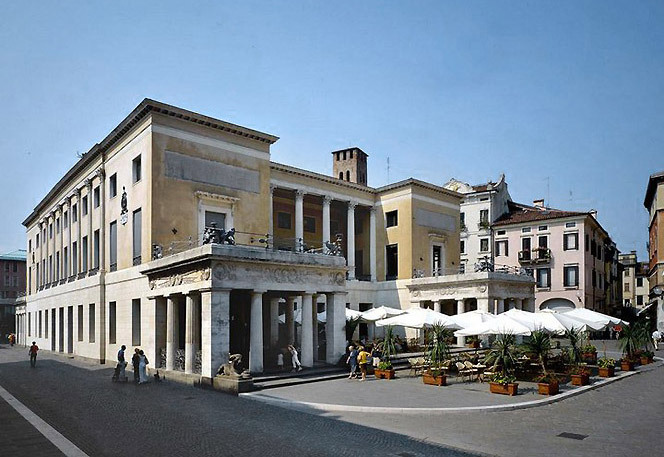 During the Risorgimento, it was a meeting place for university students, patriots, and even positivist scientists: in 1839 it was the venue chosen for the first meeting of the Società italiana per il progresso delle scienze (“Italian Society for the Advancement of Science,” still active today). 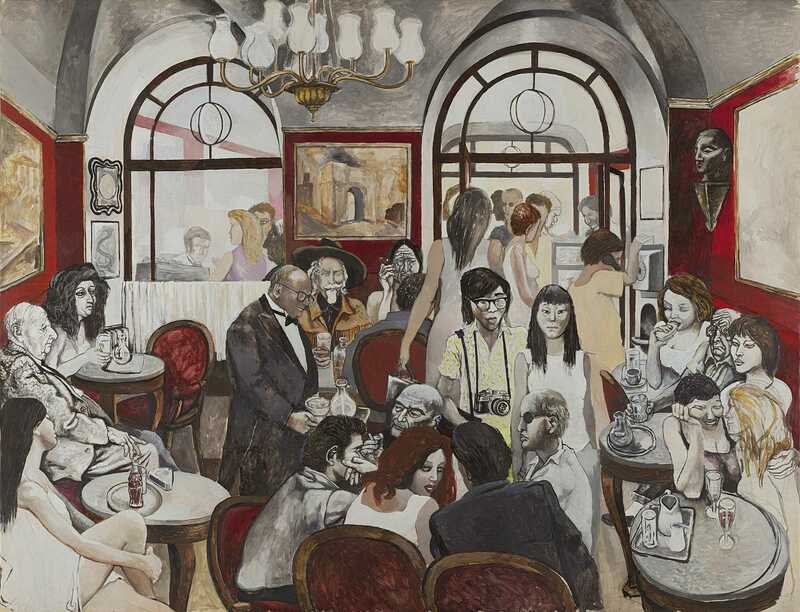 Caffè dell’Ussero boasts its own list of celebrity-patrons, including Nobel laureate and poet Giosuè Carducci, philosopher Giovanni Gentile, the founder of Futurism, Filippo Tommaso Marinetti, and writers Curzio Malaparte and Ezra Pound. Philosopher Filippo Mazzei (a friend of the first five American presidents) and Thomas Jefferson also stopped by the café at some point. Some say the visit was what inspired Jefferson to include the “pursuit of happiness” in the 1776 Declaration of Independence. 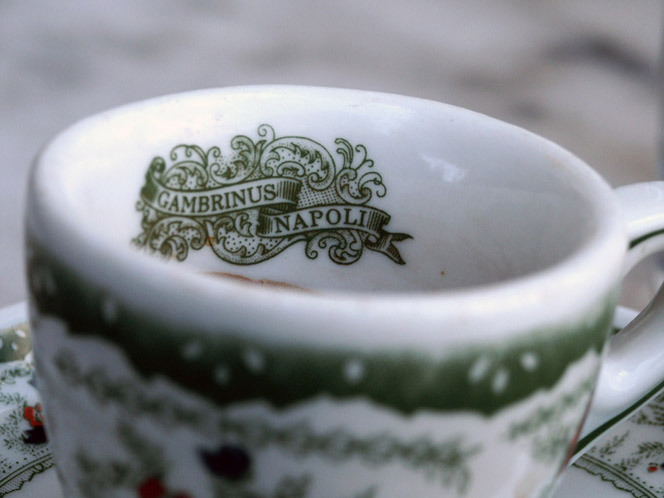 Caffè Giubbe Rosse was founded in Florence in 1897, by two German beer makers, the Reininghaus brothers. Since locals had a hard time pronouncing their last name, they usually arranged to meet “where they wear red shirts,” as the café’s waiters wore uniforms inspired by the Viennese fashion of the time. 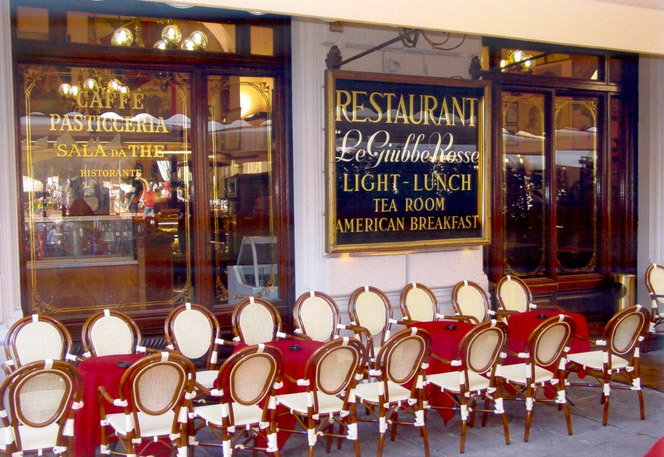 Giubbe Rosse is one of Italy’s most famous literary cafés – and indeed is often thought of as the country’s literary café par excellence, having served feisty Futurist militants such as Papini, Soffici, Prezzolini, Marinetti, Boccioni, Palazzeschi, Carrà; intellectuals who wrote for “Solaria”, “Frontespizio” and “Campo di Marte” after the First World War (such as Montale, Gadda, Saba, Bo, Luzi, Landolfi, Gatto, Pratolini, Bigongiari, Parronchi); and then a number of intellectuals – including Vittorini and Quasimodo – after the Second World War. 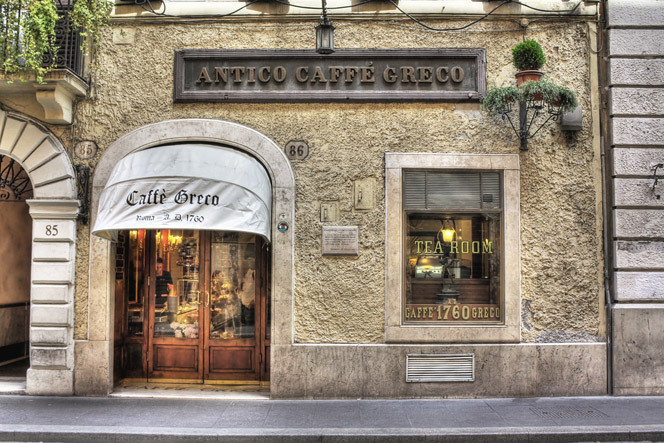 Let’s move on to Rome’s Antico Caffè Greco, the capital’s temple of culture since 1760. 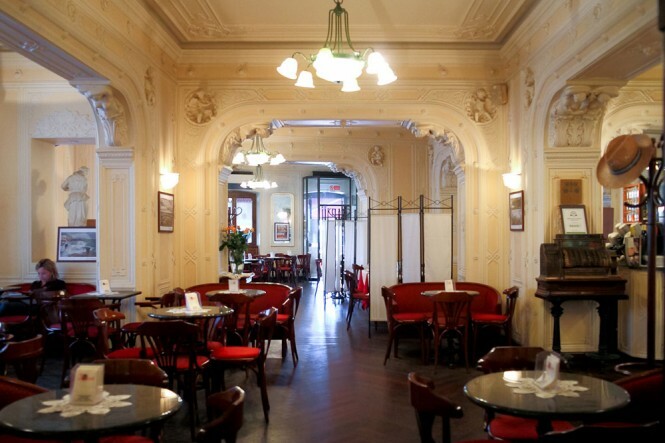 Although its name was probably meant to recall the Greek origins of its founder, Nicola della Maddalena, it was also known as “the German Café” for some time because of its many loyal German patrons, including celebrities such as Schopenhauer, Wagner, Liszt and Mendelssohn. 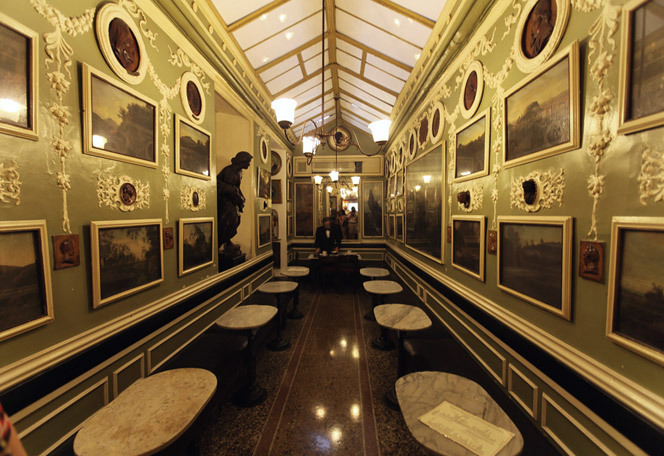 Caffè Greco is also one of the world’s biggest private art galleries open to the public, and the venue of monthly meetings organized by “Gruppo dei Romanisti” (an association of academicians and experts on the history and culture of Rome). Roman poet and painter Cesare Pascarella (1858-1940) wrote about it, While seeing so much of the earth around it change and change again, popes climbing and descending from the chair of Saint Peter, kings and emperors appearing and disappearing from the global scene, fame rising and falling, and so many competitors being born and closing down, this old Roman café – amid such immense, tumultuous, tragic and comic successions of men and things – may have had to change hands a few times, but never changed its identity, and unfailingly remained an honest and moral café. Finally, we reach the Gambrinus, where Oscar Wilde often came while living in Naples – where he took refuge in 1897, after spending two years in Reading Gaol on a “gross indecency” sentence. Wilde certainly did not go unnoticed in the grand café, but perhaps was a bit bothered by the rumors around him – having once declared that There is only one thing in life worse than being talked about, and that is not being talked about. 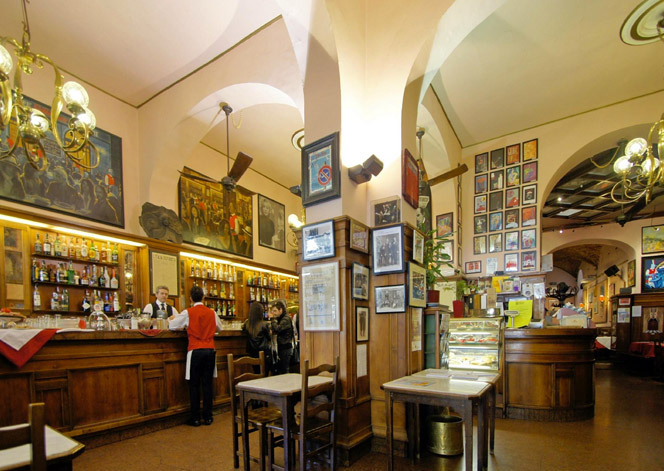 Gambrinus was founded in 1860 in one of the most beautiful parts of the city – facing Piazza Trieste e Trento and the famous Piazza del Plebiscito – and has welcomed a number of famous patrons over the decades. We can imagine its vault ceilings and beautiful walls – decorated with marble, golden stuccoes, bas-reliefs and works by great Neapolitan landscape painters – listening to the local Belle Époque bourgeoisie chat, or to the words of Italian and foreign celebrities such as Hemingway, Sartre, Croce, D’Annunzio, Totò, the De Filippo brothers… and even Bill Clinton.